It has long been known that West Ham would take over the Olympic Stadium in Stratford, East London after the Games. Boris Johnson and the government have repeatedly stated the need for it be sold rather than used for various national events, as it would become (and has been) a major drain on the taxpayer. The battle for ownership of the stadium was fought out between Tottenham Hotspur and West Ham, with Leyton Orient even arguing that due to their location they should be part of any deal, for fear of fans being taken away. Spurs would have perhaps had a much better chance of filling the stadium, given their possible partaking in the Champions League, and of late, competition for the Premier League title. However, despite West Ham’s relegation worries of a few years ago, they won the rights to the Stadium, largely because they planned to keep the running track (or most of it). The move from current home Upton Park to the Olympic stadium is expected to take place in time for the 2016-2017 season, providing construction is completed. However, up until today, where the necessary funding would come from has been a bit of a mystery. Now it all seems to be in place. The club will have the stadium on a 99 year lease. In reality, West Ham, despite being guaranteed major occupants of the stadium, will pay only very little of the enormous cost estimated. The Treasury will contribute about £60 million, today confirming an extra £25 million on their part, which is the main reason the move can go ahead. The London Legacy and Development Corporation will provide a loan of £20 million, and another loan from Newham Council will provide 40 million. Boris Johnson is also expected to make a contribution. The go-ahead was finally authorised when the club agreed to up their part of the budget from £10 million to £15 million. There are several areas that the money will go towards. The venue is not ideal for football, and especially for West Ham who struggle to fill the 35,000 capacity Upton Park, and thus the capacity of the Olympic Stadium will be reduced from 80,000 to 60,000. The main problem with athletics arenas is that due to the running track, fans feel far away from the action. Thus it will be partially brought forward, but not all the way. The roof will also be extended to cover all fans, and this must be completed by 2015 in time for the Rugby World Cup. West Ham want the stadium to be used for athletics in the future and intend to keep the Olympic legacy at the stadium, as well as use it for live music performances. This is the only reason West Ham’s bid was successful. West Ham of course must pay back these generous loans. They will also pay £2 million annually to rent the ground and have agreed to share 50/50 all catering and hospitality revenue with LLDC, but will keep all ticket and merchandise sales revenue. The club directors, David Gold and David Sullivan have agreed to make a one-off payment to LLDC if they sell the club within ten years, and a proportion of any future sale after that. They stated that “the public should benefit from any money made” by West Ham’s future sale of the stadium. The move giving West Ham ownership has always seemed an odd decision. Firstly, it is a huge stadium, it will be as big as Arsenal’s Emirates’ Stadium, and the third biggest football arena in England and West Ham are not as big a club as Arsenal. Thus if they can’t fill the stadium on a regular basis there will be little or no atmosphere inside, only harmful to the club. However the main question is of course regarding public money – Boris Johnson made it clear that the future use of the ground must not drain the public purse anymore than it already has. The Tottenham plan for the ground would have been largely privately funded, not costing the taxpayer a substantial amount more. West Ham are planning to contribute approximately 6-8% of the overall finance of the stadium’s conversion, hardly fair given that they will be the principal users. The decision seems to have been made on the emotional grounds that West Ham would preserve the “spirit of the games” something which could have been done much more cheaply. Spurs’ plan would have saved the public a lot more money and would have likely been much more successful for the club. Whilst geographically it makes much more sense for West Ham, in times of austerity it makes much more sense to allow Spurs to move. Thus it was emotions, rather than rationality that won the bid for West Ham. rubber-stamped early in the new year following club meetings. Racism has long been an issue. The media is awash with its coverage of racial incidents in football. Yet why are we pretending that racism in football is a new issue? games. In the 1980s, racism in football in England reached fever point. racist chants and banners from opposing fans during his time at Spurs. against Everton, whose fans chanted ‘Everton are white’. offence surfaced on the internet. Last season was overshadowed by the Suarez and Terry incidents. Sunderland, Swansea City and Manchester City. behaviour? There has been increased intensity and exposure in the media. is a quick way to earn some brownie points amongst his voters. further distance foreign players from a solution which can be accepted. the box in terms of the language they use when talking back to a player. use language that is offensive. UEFA’s financial targets: crossing the line or fair play? Usually, AC Milan’s dealings are always strictly connected to the political career of its owner Silvio Berlusconi. In 2009, when the Brazilian player Kakà was about to be sold to Manchester City, Berlusconi interrupted a negotiation that would have cost him a lot in terms of votes in the upcoming European elections. The signing up of Ronaldinho was often mentioned during electoral meetings as an example of a promise to the fans that had been kept. Lately, Berlusconi said that Cristiano Ronaldo might wear one day the rossoneri shirt. However, the recent transfer of Thiago Silva and Zlatan Ibrahimovic from AC Milan to Paris Saint-Germain for 62 million euro doesn’t have anything to do with Berlusconi and politics. This time, it’s all about money. Football fans all over Europe know well how once troubled and not very successful clubs have now reached the top of their leagues. It has all been very simple. They have been taken over by extremely wealthy owners, willing to bring the club to the football Hall of Fame. It has happen to Chelsea and Manchester City in the English Premier League, to Malaga in Spain and lately to Paris Saint-Germain in the French Ligue 1. Is it fair to invest millions of euro in football in times of crisis? Probably, during these dark times, it’s suitable to find foreign investors to maintain the football circus. Panem et circenses, “bread and games”, were the main ingredients of mass distraction according to the ruling class of the Roman empire. However, in this article the question “Is it fair play?” refers to the economic competition between “old”, traditional clubs and the newcomers. Is it fair to bring fresh money to invest and spend millions of euro to buy the best players? Is it part of the game or is it unfair competition with the other clubs? The financial fair play project was introduced by UEFA’s chairman Michel Platini in 2009. According to this, clubs should have a balanced budget in order to reach the final goal of financial self-sufficiency. Also, there are certain investment goals to be pursued. Firstly, investments should improve the infrastructures of the club, particularly the stadium. Secondly, the development of the club’s youth teams should be a privileged target. Finally, clubs should put the brakes on players’ salaries and transfer costs, in order to decrease inflation in the football market. Hence, the definition of financial fair play doesn’t consider unfair that some clubs are wealthier than others. Nevertheless, rich clubs should also stick to the investment goals set by UEFA. As things stand now, the wealthiest football clubs of Europe surely comply with the first goal. Stadiums have been renovated and surrounded by leisure infrastructures (hotels, restaurants, etc.). But when it comes to the other two main investment targets, these clubs do not adhere to the rules of financial fair play. There doesn’t seem to be a focus on the youth teams. 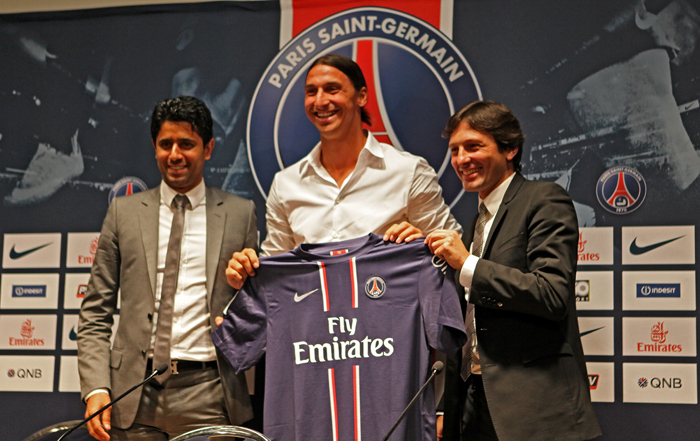 Instead, they have a short-term strategy based on buying the best players around, like Ibrahimovic and Thiago Silva. As a consequence of this strategy, the wealthiest football clubs completely break the third main principle of financial fair play. By offering outstanding contracts to players and paying huge amounts of money for their transfers, the rich newcomers of European football do nothing but increase the inflation in the football marketplace. In doing so, they have a monopoly on the strongest players, creating a bigger and bigger gap between themselves and less wealthy clubs. Is it fair play? On the one hand, it is. Foreign investments, especially in the football circus, and particularly in times of economic crisis, are more than welcome. There is nothing wrong with Malaga, Manchester City or Paris Saint-Germain replacing AC Milan, Juventus or Manchester United as the unbeatable teams in their respective leagues. On the other hand, the new tycoons of European football are not playing fair, in that they do not completely adhere to UEFA’s investment guidelines. They are paying too much for transfers and players’ contracts, and they do not have a long-term plan to grow young players in the youth teams. In this sense, Barcelona’s cantera (the “reserve” of champions coming from youth teams) is the right model to follow. Only if the new powers of European football start to play fair can there be a future for the game of football. If they don’t, we might have a “football-bubble”, ready to explode. Why did no women make the BBC Sports Personality of the Year 2011 shortlist?